Traditional office desks will likely never go out of style, though they do seem to play a more limited role in the office environment than they did in the past. Consisting at its most rudimentary of a rectangular surface propped up by four vertical supports at each corner, the traditional office desk is the most basic type of workstation that there is, keeping its general form close to historical counterparts found as far back as even seven centuries ago. Today’s traditional office desks can come in a variety of more modern materials, such as plastic and metal, but most people still picture the traditional office desk as a wooden object that evokes a sense of history, dependability, warmth, and just simpler times. 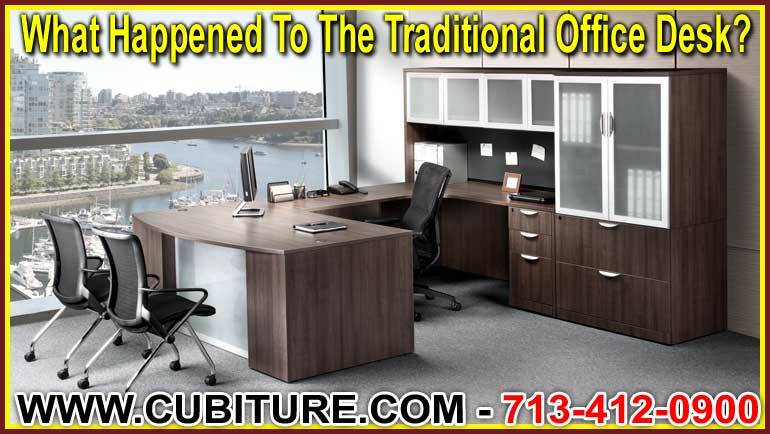 Many traditional office desks showcase varying degrees of decorativeness, and most integrate storage features into their vertical elements often in the form of cubby holes, cabinets, or drawers for files or more general objects. While the traditional office desk still graces many offices today, contemporary desks have gained a lot of popularity over the years. One of the major drawbacks of the traditional office desk is the “limited” space they provide. Granted, they can come in many sizes, with more stately executive office desks boasting work surfaces as expansive as 25 square feet. However, because the traditional office desk is still partially defined by its rectangular work surface—a shape that doesn’t always accommodate the dynamic scope of modern office workflow needs—they’ve become a bit obsolete in some office spaces. Contemporary or modern desks, on the other hand, are best suited to more dynamic and creative work. They usually characterized by more adaptive configurations, and unlike traditional office desks, the importance of function means that you’ll rarely find a contemporary desk option that includes fine decoration and detailing. The advent of new technology began to add multiple dimensions to an office employee’s daily workload. The work surface of the traditional office desk had to be re-imagined as new personal office equipment would potentially compete with a limited amount of desk space. Different styles and shapes emerged to accommodate extra work zones for office equipment. The L-shaped desk originated from the need to devote an extra wing to provide space for the typewriter, now essentially replaced by the personal computer. Holes near the back of the work surface allow for the free passage of cables, and storage space is modified to store computer hardware and software. The U-shaped desk is another alternative to the traditional office desk. This shape is perfect for spatially incorporating a variety of additional equipment, including a desk lamp, a copier/printer/fax hub. Corner desks are also popular for when spatial limitations are an issue. Today, we have the luxury to enjoy any of these possibilities in different desk configurations. Whether you want to emulate the beloved traditional office desk, or if you prefer any of the various contemporary forms that embody the changing dynamics of your workplace, at Cubiture Jerry can make any of these possibilities a reality for you. Give us a call and we can discuss finding the right desking solutions to your workplace.